During the recent Summit of the Community of Latin American and Caribbean States (CELAC) and the European Union in Santiago, Chile, Bolivian President Evo Morales reiterated his demanded that Chile give up national territory to provide Bolivia with more convenient access to the Pacific ocean. 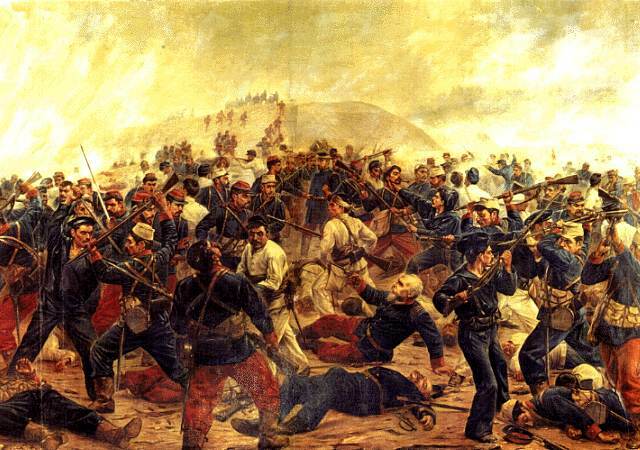 Oil Painting by Juan Lepiani which represents the Battle of Arica on June 7, 1880. According to territorial lines drawn up in Treaty of Peace and Friendship signed by Bolivia in 1904, Bolivia ceded territory previously connecting it to the Pacific. The treaty was signed 20 years after Bolivia found itself on the losing side of the War of the Pacific, in which Bolivia and Peru united against Chile from 1879 until 1883. The treaty connected the Chilean port of Arica to the Bolivian capital La Paz, by guaranteeing freedom of transit for Bolivian commerce to the coast. To this day, Bolivians nurse resentment over the loss of their access to the ocean. Meanwhile, Bolivia’s erstwhile friend, Peru, has been unenthusiastic about working out maritime access through Peru’s vast stretch of Pacific coastline. Chile’s relative economic and social progress in the past 20 years has served to amplify populist ire from both Peru and Bolivia, as their own economies have struggled through far more apoplectic periods comparatively, and have often used Chile as a scapegoat for their economic malaise. Graffiti on shops in Bolivia, to this day, have strikingly venomous messages warning of Chilean ownership. Bolivia has constructed monuments lamenting Bolivia’s loss, and promising vengeance. Morales presided over the implementation of a new constitution for Bolivia in 2009, which includes a provision claiming sovereign right to territorial access to the Pacific despite the treaty with Chile. More recently, Morales has threatened to bring his demand for Chilean territory to the International Court of Justice (ICJ), and even sent watchers to observe during a recent hearing at the ICJ between Chile and Peru regarding maritime borders the countries share. For his part, Piñera expressed a desire to end “these arguments between deaf people,” and noted current favorable terms Bolivian businesses already receive in Chilean ports, adding that 70 percent of Bolivian maritime trade already moves through Chilean ports. Further complicating the already tense relationship between Bolivia and Chile, an incident involving armed Bolivian solders was reported in northern Chile, where they reportedly crossed a few kilometers into Chile, where they were eventually arrested after shots were reported by witnesses. Chile’s Minister of the Interior, Andrés Chadwick, said that three soldiers were arrested carrying military weaponry. While a similar incident in June of 2012 resulted in 14 Bolivian soldiers being arrested after crossing the border, the most recent incident occurred just one day before the recent CELAC-EU summit in Santiago, and just before Morales’ most recent demands for Chilean territory.